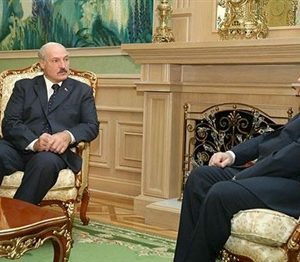 At a meeting last week, President Alyaksandr Lukashenka did his best to persuade the Armenian foreign minister of Belarus’ goodwill. But this was hardly convincing – the halcyon days of close relations between the two countries are long gone. Now Minsk is clearly siding with Azerbaijan, even though the latter is opposing Russian policy in the South Caucasus. The USD 300 million loan given by the Azerbaijani president to Lukashenka this summer and visit to Baku by the Belarusian prime minister in July were just some recent signs of a strong partnership between Aliev and Lukashenka. Besides its neighboring nations in the post-Soviet area, Belarus maintains very close relations with Azerbaijan, Kazakhstan and Turkmenistan. In the late 2000s Azerbaijan apparently became the single most important customer buying significant amount of weapons from Belarus. In the words of the the Belarusian Ministry of Foreign Affairs*, cooperation with Azerbaijan was only activated “in recent years”. Until the mid-2000s, political relations were negligible and trade developed of its own accord. Lukashenka did not get along with former President Heydar Aliyev, a seasoned apparatchik of the Soviet period who looked down on Lukashenka as a young maverick. Another reason for poor relations in the past was that Minsk tended to follow Moscow's foreign policy line. As a result, it developed relations with Azerbaijan's nemesis – Armenia. In the aftermath of the Cold War, the only Belarusian embassy in the region was based in Yerevan. In the late 1990s, Minsk finally decided to establish a presence in Baku but the embassy was opened only after a considerable delay in 2006. However, over the past decade, relations have improved dramatically. In Baku, Heydar Aliyev’s son Ilham inherited presidential power in 2003. Already in 2004, the heads of state of Belarus and Azerbaijan broke with precedent by conducting mutual visits. This set the stage for four top-level visits from 2006. At the same time, Belarus deviated from its stringent pro-Russian political line. Lukashenka found new friends – among them not only Yushchenko of Ukraine and Saakashvili of Georgia, but also Ilham Alyev. In this process, the enhanced international stature of Azerbaijan played an important role, especially after the country launched a new Caspian oil pipeline. Belarus could hope for support from Baku as a natural ally against Moscow in the post-Soviet area. Azerbaijan had long bolstered Russia's opponents; in the past, it even went so far as to establish the GUUAM – an alternative organization to pro-Moscow integration initiatives – with Georgia, Ukraine, Uzbekistan, Azerbaijan, and Moldova. Although this organization is now moribund, Azerbaijan’s attitude toward Moscow remains unchanged. A second set of factors are economic. Between 2008 and 2010, Belarus-Azerbaijan trade grew from US$ 100 m to US$ 146 m. More important than this moderate increase is the fact that Belarus enjoys a trade surplus, which helps to counteract its immense foreign trade deficit. Azerbaijan is also helping Belarus to acquire alternative oil sources. Minsk recently began importing oil from Venezuela but direct shipments to landlocked Belarus are difficult. Baku thus agreed to swap schemes by which Minsk gains access to Azerbaijani oil in exchange for Venezuelan oil. For Azerbaijan, an added incentive to work with Belarus is to garner support for military liberation of its territory occupied by Armenia and removal of self-proclaimed Nagorno-Karabagh Republic. Negotiations in the OSCE Minsk group have rendered no results for years now. Meanwhile, the Azerbaijani government has used its growing oil revenues to perennially increase its military budget. But a stronger military will not change the fact that Armenians have Russia behind them. Although Russia wants to preserve Azerbaijan as an ally in the Caucasus, Azerbaijan is eager to change the status quo balance of power. It is only a matter of time before armed conflict breaks out again between Azerbaijan and Armenia and it may occur as soon as the Azerbaijani government sees less sense in tolerating the current situation which helps Armenia to legitimize the present favorable reality for Yerevan. If such a war should ensue, Belarus will probably side with Baku, the principal buyer of its weapons. It is notable that no arms deals were made prior to 2005 – there is thus an unquestionable link between a stronger Azerbaijani military and the initiation of bilateral arms deals. By contrast, Armenia bought a small number of weapons from Belarus just once, in 2007. The development of the Belarusian-Azerbaijani alliance is practically a fait accompli. Azerbaijan is openly defending the Belarusian regime from criticism in the West, as the positions of Azerbaijani representatives in the OSCE Parliamentary Assembly and EuroNest have demonstrated. Alyev is also willing to help Lukashenka financially –in addition to the latest 300-million loan, not so long ago, Minsk borrowed from Baku to pay Moscow for its outstanding claims. For Azerbaijan, the motives for working with Belarus are political and economic. The Central Asian state needs all the support it can get if it wants to confront Armenia and Russia, not to speak of its tense relations with Iran. It cannot be very hopeful about Western support, given the influential Armenian lobby there (especially in the US and France). This makes support from former Soviet states all the more important. At the same time, the privatization of Belarusian industries and development of non-Russian oil supply routes is vital – Venezuela is a good example. For Belarus, cooperation with Azerbaijan is important as a tool to put pressure on Moscow, to obtain financing, and to develop trade. In particular, Azerbaijan may allow Belarus to access non-Russian oil and gas from the Caspian and Middle Eastern regions (Iran and Northern Iraq). The greatest hurdle for such a project would be neither technical nor financial – the infrastructure is mostly already in place. Rather, it is political: the Russians will stubbornly fight to preserve their energy monopoly in Eastern and Central Europe, while the United States will work to block any regional energy projects that involve Iran. Belarus is on the verge of breaching one of its serious international ecological commitments. If the government plans to extinguish Belarusian swamps goes ahead, this could have implications for the rest of Europe. This summer, the Belarusian government launched a new initiative on energy generation, which will lead to the extinction of the last large swamps in Belarus. These swamps are the only natural territories of their kind in the European temperate climate zone, which were not disturbed by human activities. The Government Decision №794 of 17 June 2011 approved peat extraction in some areas including eight natural bogs in the country. In effect that would lead to extermination of that peat. The new peat extraction project has been initiated by the Energy Ministry. Their reasoning is simple – Belarus is seeking for new energy sources as Russian gas and oil are getting ever more expensive. In Soviet times, Belarus was well-known for drying the bogs and producing peat fuel. It is not surprising that in times of harsh economic crisis, the idea of using old solutions seems so attractive. In particular, the Energy Ministry considers peat as the main way to provide energy for cement works. This cement will be needed urgently when the Chinese investment plans to build new facilities in Belarus will be implemented. The author of the new peat extraction program, Dr Ivan Lishtvan of the National Academy of Sciences, argued that out of 4.4 billion ton of peat in Belarus 3.3 billion tons might be extracted for energy needs. Besides non-protected peatlands, he proposed to include peat bogs located both in national protected areas and in internationally-known reservations such as the Biarezinsky Biospheric Reservation, the National Park “Belavezhskaya Puscha” and the National Park “Prypiatski”. The Ministry of the Environment is strictly against the new program, and its employees have clearly protested against it even in media. That came as surprise because open quarrels between government institutions in the media are almost unheard of. Yet the place of the Ministry of the Environment in the official hierarchy and in the governmental decision-making process is a very low one. Therefore, the ministry cannot overrule the decision after it was taken at the top of the hierarchy. Interestingly, all estimations underlying the project are questionable. Another scientist, Aliaksandar Kazulin of National Academy of Sciences says that the country does not have such large peat deposits. The last study made by the Academy and the Environment Ministry based on the Google satellite images proved that the area of Belarusian swamps estimated by the Energy Ministry was largely exaggerated. Previously the researchers had estimated that there might be about 1.4 billion hectares of undisturbed swamps. Now they believe there are just 862.6 thousand ha – 59% of which are seriously disrupted by neighboring peat extraction and melioration. Accordingly, the unextracted deposits make up not 4.4 billion tons but only 160 million tons. In Minsk, those working on the protection and re-wetting of peat lands have been utterly shocked when learning about the Government's decision. Firstly, some of the areas to be dried out and exploited are protected natural territories of international significance that are covered at least partly by three major international environmental conventions – the Ramsar Convention on Wetlands, the conventions on migrating species and on biodiversity. Secondly, some of the protected areas are included in a large-scale project on peat bogs regeneration carried out with significant contributions by the UN and other foreign donors. The money has been given to the government under the condition of sustainable bogs' use in the future. Among the targeted areas there are the peat lands of “Dakudauski” and “Morachna” which have been regenerated recently as part of a UNDP/ Global Environmental Facility (GEF) project. USD 1 million given by international donors, including the money of the Federal Republic of Germany, were spent on the project. Violating international ecological commitments does not seem to be a wise step at a moment when Belarus is internationally isolated and ostracized by its European neighbors. Ecological projects are some of the few that the international community is ready to support in Belarus even when the political climate is as chilled as it is under the given circumstances. 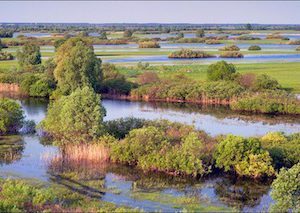 It is in the interest of the European countries to protect and regenerate Belarusian swamps – which are unique in Europe – as they contribute to a better climate in the whole region. The donors are, however, not likely to continue the projects when it gets clear that climate regeneration is clearly not on the priority list of the Belarusian government. Moreover, the money coming to Belarus through those large projects constitutes an inflow of the bitterly needed hard currency. Given the fact that the project means are linked to the condition of sustainability, Belarus might be about to ruin further chances to profit from international money. For those working on the projects it is hard to imagine any further cooperation with Belarus if their work will be destroyed for the purpose of gaining cheap energy. The consequences of the new program will not only be felt on the level of international cooperation but also throughout the country. In addition to threatening rare species, the climate in Belarus will become drier. Although up to now Belarus was famous for its excellent freshwater deposits, they depend on the swamps system, and cannot be sustained without swamps. The swamps prevent large-scale floods and they take in water after snow melt and big rainfalls. Apart from those practical arguments, the annihilation of the swamps also contains a sentimental element for many Belarusians: They traditionally see themselves as “people from the swamps”, the bogs and wetlands play an integral role in the national consciousness. Large swamps are characteristic for Belarus, a country that possesses neither sea access nor mountains. Belarus without swamps is unimaginable for many Belarusians and will deprive them of one the few specifics that can be a competitive advantage for the development of tourism in Belarus. Although in private, those Belarusians knowing about the government plans complain about them, they are far from staging a protest or establishing a civil action committee as it would be the case in other European countries in a similar situation. It seems that the new energy policy is just another example of arbitrary decision-making by the Belarusian government. If the government – which does not report to anyone but the president – had thought twice or undertaken serious inter-ministerial consultations on the matter, it would have been clear that more is at stake than just a few swamps. In the face of the crisis, the government again fails to seek new ways but stays with old Soviet models and recipes. However, not all is lost – the extraction of peat has not yet started. Hopefully, the government will understand in time that it risks losing international support and money as well as selling the country’s ecological future for some cheap energy.